The South Carolina Drought Response Committee, meeting via conference call on August 17, upgraded the drought status for 17 counties in the state. The table below provides selected COCORAHS station rainfall totals for June 1 – August 15, 2016. Normal precipitation for this period ranges from 11 to 16 inches. Fourteen counties were upgraded to “incipient,” the first level of drought: Lancaster, Kershaw, Chesterfield, Marlboro, Darlington, Lee, Florence, Dillon, Marion, Williamsburg, Georgetown, Horry, Beaufort and Jasper. Three counties were upgraded to “moderate,” the second level of drought: McCormick, Greenwood, and Edgefield. Oconee, Pickens, Anderson, and Abbeville counties remain in moderate drought, and all other counties remain in incipient status (see map). According to South Carolina State Climatologist Dr. Hope Mizzell, there has been a shift in the rainfall pattern over the last few weeks, with the very dry Upstate finally receiving some much needed rain, while rainfall for the Pee Dee region has significantly decreased. Despite improved rainfall coverage for the Upstate, the Committee decided to maintain the drought status of those counties out of concern the rainfall relief may be short-lived. 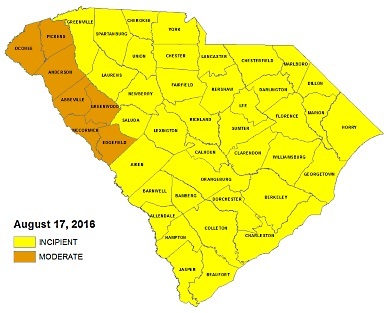 The Committee decided that the lack of rainfall in the Pee Dee was sufficient to warrant an upgrade to incipient for all counties in that region. The primary drought impacts being reported at this time are to agriculture, and for some counties those impacts are highly variable and may be significant. “While we on the drought committee recognize that the agriculture community is possibly experiencing a moderate drought, there are not enough other indicators at this time to justify an overall upgrade to moderate drought for the Southern Drought Management Area,” said committee member Marion Rizer, a Colleton County farmer. According to Mizzell, the committee faces a challenge as they try to agree on a declaration for each county that takes into consideration multiple factors, including agriculture, forest fire risk, water supply and water quality. Conditions for each of these factors can vary widely across a particular county. For example rainfall for portions of Colleton County over the last 30 days have ranged from only 3.6 inches to 10.16 inches, a range of almost 7 inches in one county. Another factor contributing to the drought and impacts to agriculture is the above normal temperatures that have persisted throughout summer. Evaporation rates are elevated and areas need higher rainfall frequency and totals just to keep up with water loss to evaporation. The Committee will continue to monitor the situation closely and will reevaluate conditions in four to six weeks.